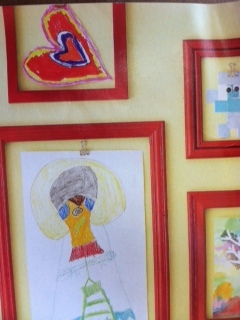 You’re kids are proud of their artwork and you are too so why not create your own art gallery to display their talent? It’s so easy, fun for the kids and a bargain option to decorating a blank wall! First, collect a bunch of frames of varying sizes and shapes but have them be all the same color (this will ensure a unified look). Remember to “shop your home” before you spend any money. You can paint almost any frame. To add a punch of color to a room, paint frames a bold, bright color that coordinates well with the existing color scheme of a room. Take the glass portion out of all the frames and remove the backings as you will not be using either. Hint: Play with the arrangement of frames on the floor below the wall before placing them until you create an arrangement that works well. You want the arrangement to be balanced and symmetrical. It’s so much easier to “play” with it on the floor rather than randomly putting holes in your wall! In order to hang the actual artwork, nail a binder clip to the wall just below the top of the inside of each frame. Kids can then clip their artwork inside the frames and change their display with ease!